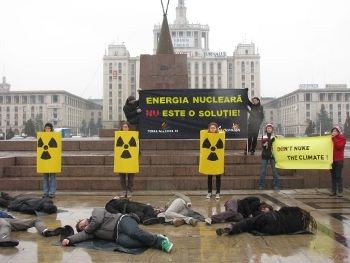 The project "wake up call" intends to raise awareness on the potential dangers faced by the possibly affected communities as well as to potential conflict within these communities affected by the nuclear waste. In the last years conflict prevention and alternative dispute resolution have gained ground and multi-party mediation processes have become success stories in communities where controversial topics had been lingering for years (especially ethnical issues, but also on topics such as designing a flood protection strategy). This will be achieved through cooperation with the Mediators’ College. But Terra III also participates in public events: conferences, workshops and meeting with students. 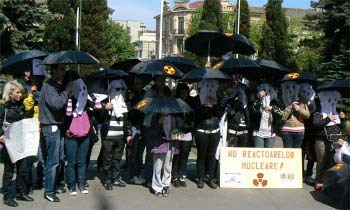 Terra III carried out a documentation on the most vulnerable areas affected or to be affected by the nuclear industry, from uranium mines to contaminated sites, waste repositories, and even uncontrolled disposal sites. The results of this documentations resulted in an online map to be used both virtually as well as in a mini-version in print to be placed as a wall-map of the country with the nuclear spots and thus impact the public with the occasion of events of/with TERRA. Highly radioactive areas on campus of Physics Faculty? For the time being, Terra has identified some highly radioactive areas (according to Geiger-Mueller counter) on the campus of the Physics Faculty. Terra III has started a media campaign because off-the-record voices claim that all the radioactive waste produced on the Faculty site is being deposited in an underground “cellar”, in an abandoned repository, that children and people having picnics in the are have unrestricted access to. 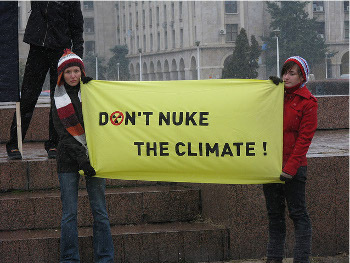 The magazine which investigated the topic contacted the National Nuclear activity Regulator and their only answer was that that particular site was no longer part of their attributions, and on top of that, the Regulator contested the Geiger counter used, saying the device was not approved and recognized by the national “empowered” institutions. This topic of illegal waste disposal was further investigated in the framework of Aarhus Convention – TERRA requested information regarding radioactive levels and safety in the area. TERRA also requested “authorized” measurements of the radioactivity levels in the area and request information regarding the conditions under which the site was “conditionally released from the authorization regime” - this results from CNCAN’s annual report for 2007, and the conditionality refers to the interdiction to practice agriculture or to build residences on the site. TERRA received an answer from the nuclear regulator saying that according to their regular measurements in the area the radioactivity levels were safe, below the limit set up by legislation. In theory, the fort where TERRA did the measurements should not be accessible to the public, so, if TERRA could entered this place it was at their own risk.